Distributor: R1 DVD from FUNimation. Related Series: Japanese auteur Akira Kurowsawa's classic film epic Seven Samurai. Also Recommended: Before or after you watch Samurai 7, you must see Akira Kurowawa's Seven Samurai. Also try Samurai Champloo and Fullmetal Alchemist. A great civil war has left the people of a futuristic Japan shattered, and the samurai jobless. Many of those samurai become bandits who steal rice from villages with the overwhelming force of their giant robots and mechanized body. The village of Kanna, shrouded in mists on top of a cliff, is tired of being pillaged harvest time after harvest time and left nothing to eat but firefly fare. They go to consult their village elder for advice. Let me lay this out on the table: I loved Akira Kurosawa's Seven Samurai. Loved it, loved it, loved it. Now for those of you who don't know, Seven Samurai is a Japanese film epic dating back to the 1950's that consistently appears on many critic's "Greatest and Most Influential Movies Ever" lists, and for me it lost none of its potency despite aging half a century. So when I heard that Gonzo had released an anime adaptation of Kurosawa's masterpiece with mecha, steampunk and a "fight the system" storyline, I feared the worst. Yes, the storyline had been approved by Kurosawa's estate; yes, the studio gave the anime twice the budget of a non-high resolution animation and yes, the anime was directed by Toshifumi Takizawa of Dirty Pair TV fame. But I had seen too many butchered Hollywood remakes of classics not to be worried. If you peeked ahead at the rating, you'll see that I enjoyed Samurai 7 to give it four stars, despite a few caveats I'll write about later. If I had expected it to be Seven Samurai Redux, it would have been a lot less, because the anime looks silly in comparison to Kurosawa's original. But to expect that would have been unreasonable, because Samurai 7 isn't so much a remake, or an adaptation- it's a tribute made with very deep respect for the memory of Kurosawa. With yes, mecha. 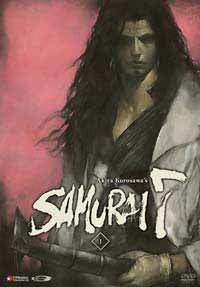 I enjoyed Samurai 7 on its own merits, regardless of its source material. There's plenty to be enjoyed in this anime. Gonzo's cast of characters largely mirror the original movie, but here because of sheer length they are given a chance to shine more than in the original epic, where the cast was a bit crowded. The best example of this is the youngest samurai of the bunch, Katsushiro. Seven Samurai clocks in at over 200 minutes plus Intermission, during which we see Katsushiro quickly grow from young, uncertain samurai to... well, still a bit uncertain of his place in the world, but hopefully wiser. Samurai 7 weighs in at over twelve hours, which makes watching Katsushiro's growth seem more natural, and come to a more satisfying conclusion. His romance with Kirara is also better developed simply because Samurai 7 has more room, and because Kirara is a stronger player in the anime, though the anime blazes its own path in how their union turns out. In fact, the anime does a fine job of taking all of Kurosawa's samurai and making them its own, not just carbon copies of their movie doppelgangers, especially when the anime goes into its final, closing arc. There is an extra storyline in Samurai 7 that doesn't appear in Seven Samurai about how merchants have become the ruling class, and how the peasants and samurai fight back against an evil emperor. The "fight the system" theme is pretty common in anime, and snobbier anime fans than I will write off the closing arc as cheap, and not in the spirit of Kurosawa's original work. To be blunt, these fans don't know their Kurosawa. The original Seven Samurai was criticized in Japan because of its theme of valuing the needs of the individual over the needs of the community, which is a strongly held Japanese virtue. Kurosawa's films were becoming increasingly Western, and he would use his movies for the next forty years to argue that the individual should not be the instrument of the group. Samurai 7 epitomizes that idea with bloody rebellion. And for me, once the anime left Seven Samurai's plotlines and told its own story, the anime really took off. The pacing is great; each episode steadily builds towards the climax. The music is serviceable despite bland opening and ending themes, and the action is fun. I get a kick out of watching samurai take down giant robots ten times their size, and deflecting lasers (yes, lasers!) with their katanas. The action is hindered, though, with washed out animation and very ugly slow mo cuts. ANN says in their encyclopedia that Samurai 7 was a very high budget release, and if that's true, the animation doesn't show it. It looks ugly, especially near the end. It gets so ugly sometimes that I had difficulty following the action. And that's a pity; this might have been a full five stars if it wasn't for that. In the end, though, Samurai 7 is a fun title that pulls off a tough balancing act of honoring its source material and entertaining its audience, who may not know or care for Seven Samurai. Recommended Audience: Violence and language makes this a preteen and up anime. Samurai 7 © 2005 GONZO, Sony Pictures Entertainment.